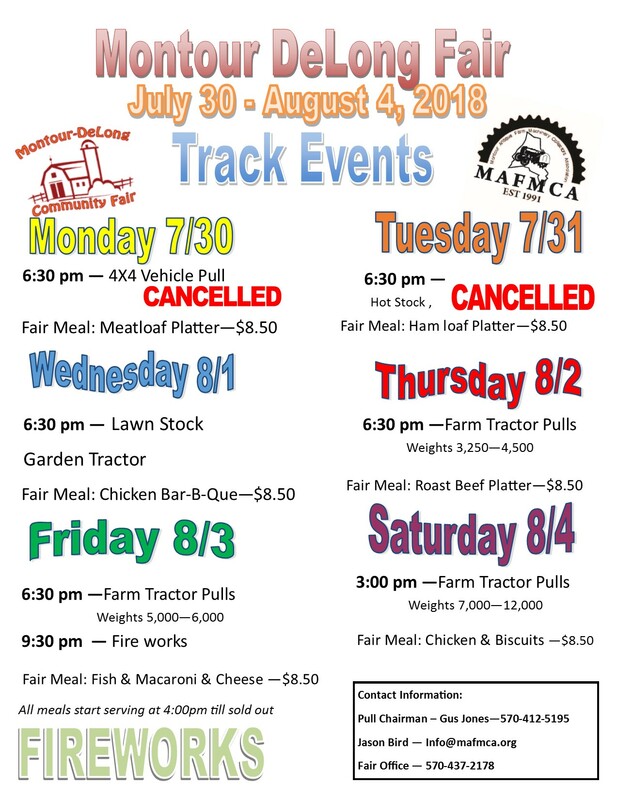 MONTOUR DELONG COMMUNITY FAIR ASSOCIATION AND MONTOUR ANTIQUE FARM MACHINERY COLLECTORS ASSOCIATION WILL NOT BE RESPONSIBLE FOR ANY DAMAGE TO TRACTORS/TRUCKS OR INJURY TO CONTESTANTS OR ANYONE ELSE PARTICIPATING IN THIS CONTEST. Driver must be 14 years of age or older (ALL non-pace classes 16 years old). *14-15 year olds must have a safe driving certificate- MAFMCA sponsor’s a course. Those under 18 years of age must have written parental/guardian permission for each pull. Any Tractor or driver found unsafe or illegal will be disqualified or barred from hooking. Drivers must stay on the seat of the tractor. Hands must be on the steering wheel, hand brakes, hand clutch or throttle at all times during the pull. Any part falling off of the tractor after being hooked and until the tractor is unhooked will result in disqualification. The Rules Committee will interpret all rules. The Rules Committee will rule on any unforeseen problems or oversights with their decisions being final. 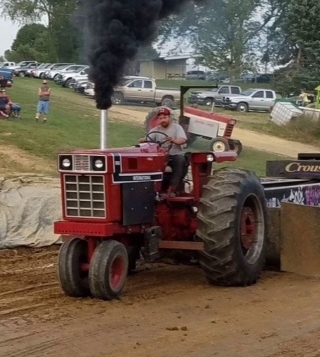 A tractor can be entered only once in each class. Registration is closed when that class starts. All pulls will be started from a tight hitch. Two starts will be given to change gears or weights within 75 feet. The sled may not be reset for pace classes at the discretion of the track officials. Tractor must stay within boundaries of the course. Pull is complete when forward motion of sled stops. A limit of 2 minutes to start your pull when call may be implemented by track officials. Tractor leaking uncontrolled excess fluid on the track prior to green flag will not be permitted to pull. Any year tractor will be permitted to pull. Pulling will be done from a stationary (in all directions) drawbar; fast hitches must be locked out. All tractors running with a stroked crank must have side shields from radiator to bell housing. The only fuels permitted are gasoline, diesel, and kerosene and LP gas. ANY TRACTOR IN ANY CLASS RUNNING 20% OR MORE OVER STOCK RPM’S IS REQUIRED TO HAVE A SCATTER BLANKET AT THE BELL HOUSING AND SIDE SHIELDS FROM THE RADIATOR TO THE BELL HOUSING. For external flywheels turning over 20% stock RPM, the flywheel must be surrounded by a minimum of 3/8” steel that is 2” wider than the flywheel itself, and the fan blade must either be removed or be shrouded at least 12” behind radiator.